Dengan slot HDMI, USB, dan micro SD sangat mudah untuk memproyeksikan video dan gambar. PPX 4350 Wireless mendukung screen mirroring (kompatibel dengan Miracast) melalui dongle Wi-Fi. Dengan fungsi audio Bluetooth proyektor dapat disambungkan ke speaker bluetooth. With 350 lumens and 720p HD resolution PicoPix is a powerful companion. Equipped with Wi-Fi you can connect to other devices and share your videos & pictures straight away thanks to wireless screen mirroring. Via HDMI/MHL you can connect notebooks, tablets, smartphones and other mobile devices to the PPX4935. 150” (381 cm) screen size and Bluetooth® audio enables you to create your own home cinema. Philips PicoPix – project your life! Philips PicoPix Pocket projector PPX3414 140 lumens dengan MP4 player. Ini proyektor saku kecil dan ringan dapat dengan mudah dihubungkan ke berbagai gadget, kartu SD atau USB stick untuk mengakses data digital Anda. Penambahan mediaplayer terpadu dan tertanam penampil kantor membuat PicoPix ini independen. 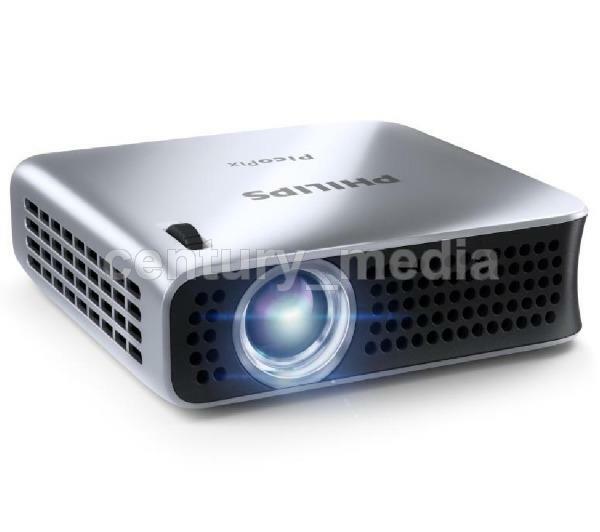 Powerful 350 lumens pocket projector with 720p HD resolution for crystal clear pictures and high contrast. The HDMI/MHL interface enables you to connect mobile devices to the PicoPix. Thanks to the possibility of a 150” (381 cm) screen size it has never been so easy to do business presentations. No matter where you are, the internal battery and the keystone correction will give you the flexibility you deserve. Not enough, with the integrated powerbank function you can also charge your mobile devices and enjoy full independency. Philips PicoPix – project your life! notebooks and tablets to access your digital content. It is also Miracast compatible and works with most Android devices.